The 2nd giveaway has ended, once again with over 1000 entrances, and the signed books are on their way to the two lucky winners! On the first weekend of August, Central Comics Fest is taking place at Porto, Portugal, and I will be having a book presentation there, as well as a small booth to sell signed copies to interested readers and give out some promo material! You can check out the event schedule right here. On other news, as announced on the main page, I will be answering some questions from RUC's Geek Freak cast, on their show soon. You can catch the show at 16 o'clock, on the 28th of July, or you may also listen online at Geek Freak's mixcloud right here. Lastly, I'll leave you with a sample of the promotional material I'll have with me for the convention. Thanks again to Tiago Meirinha for the amazing artwork! So, the book presentation went really well, you can check out a bunch of pictures here, and the trailer in the main page. Hopefully, soon it will bear fruit. The giveaway ending on the same day reached over 1000 entrants, and so, as promised, I have started a second one. Anyone not lucky enough to have won the first time around, just click below to enter for another chance. As for the three lucky winners, really hope they enjoy the read, and I will be expecting to hear their honest reviews. Giveaway ends July 22, 2015. Only a couple days left to end the giveaway, and we're slightly over 400 requests! 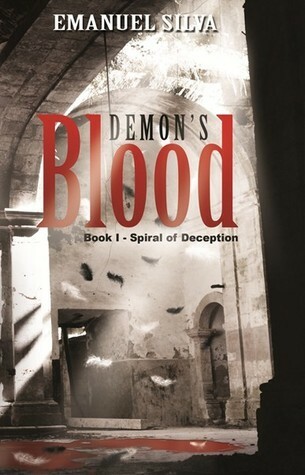 Anyone interested in a free signed copy of Demon's Blood: Book I - Spiral of Deception's revised edition, don't forget to enter for a chance to win! Giveaway ends July 12, 2015. Sunday, the 12th of July I will be having a book signing and presentation at Fnac Coimbra, and at the end of the day the winners of the giveaway will be known. If all goes well, monday I'll be shipping the books!